The disaster of a woman who tried to blackmail Liza finally releases her book about her "special" dog, Pearl, and her “wisdom.” But as a shock to Liza and Kelsey, the book is seemingly a hit. With all of her fans nearby, the author gets kind of gets cocky, but Kelsey quickly reminds her that Liza rewrote every page to give the book the depth and voice that it needed. Charles, like everyone else, can’t believe that this novelty book about a dog philosopher is generating so much buzz. Apparently young people want to read about what their pets are thinking, so Charles, likely thinking of how this financial mine can virtually carry Empirical, tells Kelsey and Liza to keep pushing forward. Now that Lauren is single again, she decides to take Maggie out for drinks and hopefully jump right back into the dating pool. Maggie, fresh off her “slash and dash” art show scene, is getting a lot of play since an article was written about it. One particularly forward woman, Donna, approached Maggie and everything seems like a win, until Maggie notices one small thing: Donna has a mustache. Maggie doesn't know how to feel about it, but since Donna is crushing on Maggie hard, she decides to go along for the ride. While Donna got Maggie’s number under the guise that she wanted to show some of Maggie’s art in her gallery, she eventually comes clean about also having a crush on her. She assures Maggie that she will definitely show her work regardless, but also wants to see where things lead romantically. Even with this confession, Maggie still isn’t sure that she can get over the mustache. She attempts to roll with it, but after an awkward interaction causes Donna to leave, Maggie isn’t all that heartbroken about it. Liza decides to have dinner with her daughter. Unfortunately, that is the time that Jay — who Liza met at that off-the-grid publishing camp Bonfire — approaches her table and mildly confronts her about blowing him off. To be honest, Liza should've followed up with him about a new job opportunity, but that’s neither here nor there at this point. Liza, clearly bad at lying and hiding her discomfort, mostly just rambles when Caitlin returns to the table. Her daughter, clueless, keeps talking about her mom. Jay is intrigued, persistent, and clearly not approaching Liza about work! They eventually end the awkward encounter with Liza agreeing to have dinner with him. I am still confused as to why Caitlin was terrible at taking hints about not mentioning Liza’s a mother, but oh well. Charles’s birthday is just around the corner, and Diana is really perplexed about what to get him. Instead of worrying about this herself, she sends Liza on a hunt. 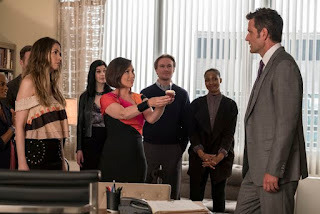 When Liza presents her array of gift options to Diana, Diana realizes she really doesn't care about Charles's birthday, and that this is more about Richard. Richard professed his love via text and Diana was extremely put-off by it. It is while ruffling through the gifts that Liza bought, Diana realizes she loves Richard and wants to give him everything! Apparently, gift-giving is her love language! With this revelation, Diana also admits that she has been overdoing it with trying to impress Charles and decides to scale back. Kelsey and Zane continue their flirt-fighting via Twitter. Charles is upset with said Twitter “feud,” deeming it unwise to swap insults in public. But Kelsey makes a harsh remark saying it has strategically upped their profile and Charles seems happy to be reaping the financial benefits of their new Internet fame. Eesh. At the dinner with Jay, Liza comes clean about her age and how she leveraged it to get a job in her field. She is open about how in the past, people have taken advantage of her and this hidden truth. Jay promises not to say anything and offers to lend an ear to Liza, if she just wants to have adult chat. Charles of course shows up at the same restaurant and Jay obviously knows him from Princeton. Jay calls Charles over to the table, and — in an attempt her secret intact —implies that he's dating Liza. But little does he know, Liza still has a thing for Charles. As the night ends, Kelsey and Zane are still flirt-fighting and handling the Twitter feud while in bed with one another. Kelsey says they need to stop spending time together while on their phones; they just need to be together. Zane immediately agrees and offers to put the phones in the kitchen and grab more wine. While taking the phones, he sees Charles's text to Kelsey about a major book deal with their current highest earner, L.L. Moore. And we all have an idea of what is coming next. Here's why you should change your phone settings, Kelsey. The next morning, it is revealed that L.L. Moore has jumped ship and Charles is understandably furious. He asks Kelsey directly if Zane has had access to her phone. Kelsey, completely shocked, cannot say no with confidence since there have been plenty of times when Zane has had access to her phone. Kelsey runs to her office to cry and confides in Liza that she thinks Charles might fire her. She also receives a ton of messages from Zane wanting to explain his side of the story. What is made abundantly clear here is that this is the major deal that Empirical needed financially. And without it, they’re in trouble. Liza, in attempt to stand up for her friend, goes to talk some sense into Charles. Charles is more upset than he has ever been. He reveals that it is because financially, they are not doing well, and he is nervous about how to even pay his staff. To make matters worse, it is his birthday and this responsibility is weighing heavily on him. In a heated and unexpected curveball, Charles also reveals that he is pissed that Liza is dating someone in his 40s who isn’t him! Naturally in that exact moment, the rest of the team surprises Charles with a birthday cupcake, bursting into his office and interrupting their discussion. The tension in that room is at an all-time high, and one thing is abundantly clear: Liza needs to make it known that she and Jay aren't dating. And she and Charles need to sort their feelings for one another out. Can we just discuss how excited I was that Charles was FINALLY honest? While Liza come clean and reciprocate his feelings? Will Kelsey get fired? And did Zane really use the knowledge he obtained from Kelsey’s phone against her? Guess we shall see next week! Share your thoughts below!